The first full moon of the year always carries the energy of hope for me this time of winter. The moon brings stronger ocean currents and higher tides for days. And sometimes this brings in more fish from the sea. And just like the Solstice- the first moon of the year is a harbinger of the light to come. Ever since the Solstice I have been checking the time against the sunrises and sunsets, and anticipating the longer days ahead. With the recent, noticeably longer days of sunny weather, and this impossibly bright silver moon shining down over the smokey hills here tonight, it is hard to believe that we are still in the middle of winter. After a record period of dry cold weather we are once again getting some warm, moist Pacific air moving in toward our coast, and the rain has helped to breathe life back into our rivers. In many places we have seen summer-like flows these last few weeks. The mountains have been freezing at about 2000-3000 feet lately, and so much of that new rain is turning to snow and ice, and staying put at the higher elevations. Just enough to enliven flows, yet not so much as to put off the fishing. We must have done something right in a previous life. The week ahead looks decidedly wetter, and a bit warmer and milder, so we expect the rains will continue to gradually feed into the rivers this way. And hopefully the colder mountain temperatures will continue to moderate these flows, and provide us with good fishing through the next week to ten days. That is a long time to forecast anything around here this time of year. But for the next week anyway, we see a mix of conditions that will put most of the river flows under the mediation of freezing levels in the mountains. And so far it looks very good. This is something to watch every day as the forecasts can change daily. I have provided some helpful links and further comments on this in earlier posts here this winter. At any rate, it looks like we can put the floating lines away and get back to slinging sink tips and sinking heads, weighted flies, and much deeper, slower swung presentations. If you are new to this game, don't hesitate to come. I have always enjoyed helping people to gain new skills and experience in fly fishing. 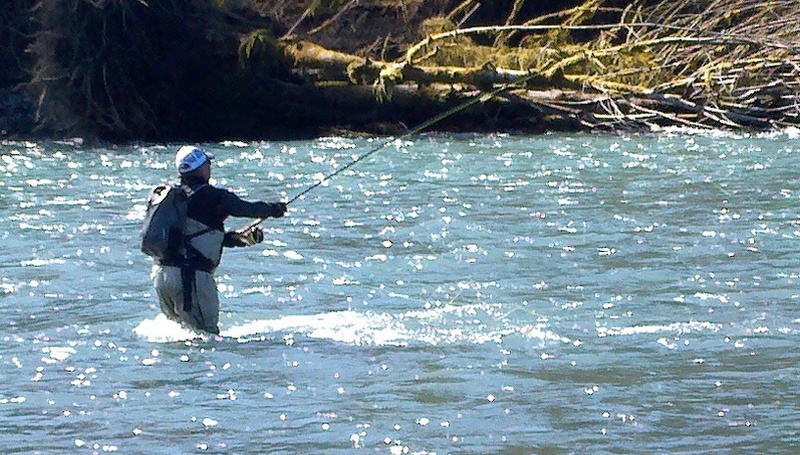 There are some very simple ways to learn how to handle even the heaviest of sink tips and shooting heads, single-handed or spey/skagit, and you will be casting and fishing well in no time. It's supposed to be fun. I have been tying winter Steelhead flies tonight and getting ready for a few trips coming up next week. Some of these flies will be a little heavier and bigger now, to match the deeper presentations. I do especially like the traditional spey flies, and some of the Pacific Northwest patterns, and I also like some of the modern shank, tube and articulated flies. I try to have a mix of some of each; large and small, with and without weight in the fly, and some brightly colored, some drab, and always some purple and black flies. As the river flows improve now it gets more exciting to think of all of the places that we might be fishing, and the bright fish we might encounter. This is one of the best things about winter- the anticipation. Each new cycle of wet weather and higher tides and stronger river flows has the potential to carry in another push of bright wild fish. It is hard not to dream of them; out there in the misty rainforest, beneath the bright moon, in the shadows of the fern and moss draped maples and firs, running upriver in the night. This is winter. 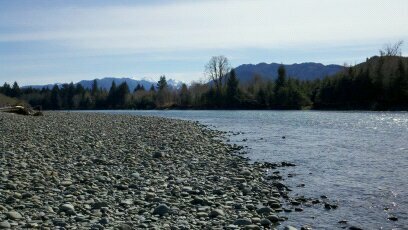 I will be guiding fly fishermen here for winter steelhead all winter and spring. These are all walk and wade, catch & release, fair chase, fly fishing only trips. We do not use indicators or jigs, nymphs or floats. We fish with a single barbless hook fly only, wet fly swing. Guests are free to use single-handed or two-handed spey rods as they wish. We take a few breaks, have a nice lunch with some hot coffee or tea. And we enjoy the day as we cover a lot of good water thoroughly, sometimes on more than one river in a day. If you want to come fishing with me you will need to plan well ahead. Feel free to call, and always leave a message and return number if I don't answer. Or drop me an email. I usually return messages within a day or two at the most.